We made the coctails strong, we got the fire on... 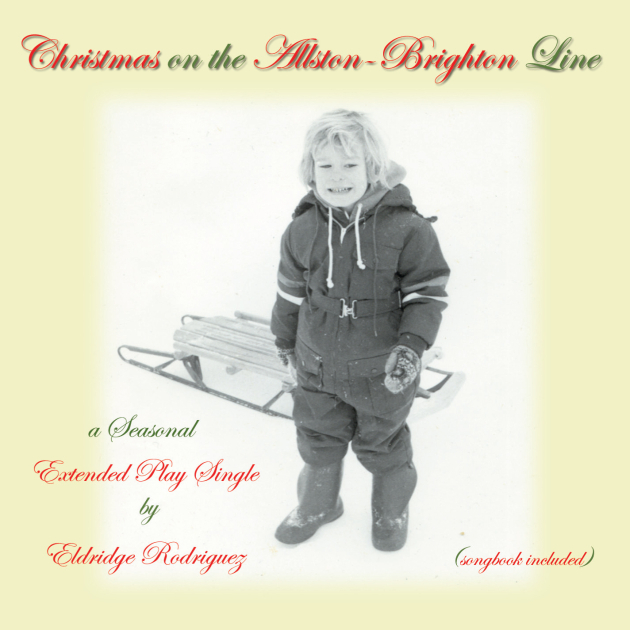 So let us be the latest to add our voice to the chorus of approval for Eldridge Rodriguez's jaunty holiday EP, Christmas On The Allston-Brighton Line. The three-song set -- the first in an annual series envisioned by the Boston-based feel-bad-pop luminary -- is as singular and as exciting as The Waitresses' "Christmas Wrapping," and as beautifully somber and evocative as Ted Pauly's "Christmas Eve, Molly Pitcher." Christmas On The Allston-Brighton Line caps a big year for Boston- and New York-based Midriff Records, which among other things also issued Eldridge Rodriguez' You Are Released in March. Mr. Rodriguez' live performance of You Are Released's "Run MF Run" was a highlight of the many shows we took in this year. This new EP is led by the ridiculously catchy incantation "Baby, I'm Alone Tonight," which would be a certifiable hit in the overground were it dropped in the lap of a Top 40 "artist." As it is, the mid-fi production suggests the song was kind of dashed off. This isn't meant as a criticism; on the contrary, it suggests ER can bash out great songs with embarrassing ease. We picture him sunken in a worn, upholstered Bunker chair in his living room, fuzzy bunny slippers up, lazily surfing channels with the remote in one hand while he jots lyrics on the subscription card torn from a magazine and itches at his NicoDerm patch with the other hand. As clever a set of lyrics as ever turned out by Mr. Rodriguez, paired with cascading piano and guitar lines, makes the song a joy to play over and over again, and as we quipped to ER earlier today, the song cries out for a video treatment. Christmas On The Allston-Brighton Line touts two additional numbers, the bouncing, roller-disco anthem "Christmas Eve (At The Old Country Buffet)" and the mellow gold of the snowy title ballad. The three songs come packaged with downloadable caroling sheets and alternate digital covers for all your desktop wall-papering needs. Buy the whole tomato at the Midriff store for three American clams right here; if you want to screw ER out of a little scratch you can instead buy the thing from any of the major digital music storefronts, which of course will take their cut and plow their record profits into price-checking jerkphone apps that will drive your friends' stores out of business. So, you know, whatever. When you coming back? When you coming back? When you coming back? When you coming back? Stream "Baby, I'm Alone Tonight" via the embed below.